Identify the most important facts surrounding the case. Identify the key issue or issues. Specify alternative courses of action. Evaluate each course of action. Recommend the best course of action. Let’s look at what each step involves. 1. Identify the most important facts surrounding the case. Read the case several times to become familiar with the information it contains. Pay attention to the information in any accompanying exhibits, tables, or figures. Many case scenarios, as in real life, present a great deal of detailed information. Some of these facts are more relevant than others for problem identification. One can assume the facts and figures in the case are true, but statements, judgments, or decisions made by individuals should be questioned. Underline and then list the most important facts and figures that would help you define the central problem or issue. If key facts and numbers are not available, you can make assumptions, but these assumptions should be reasonable given the situation. The “correctness” of your conclusions may depend on the assumptions you make. 2. Identify the key issue or issues. 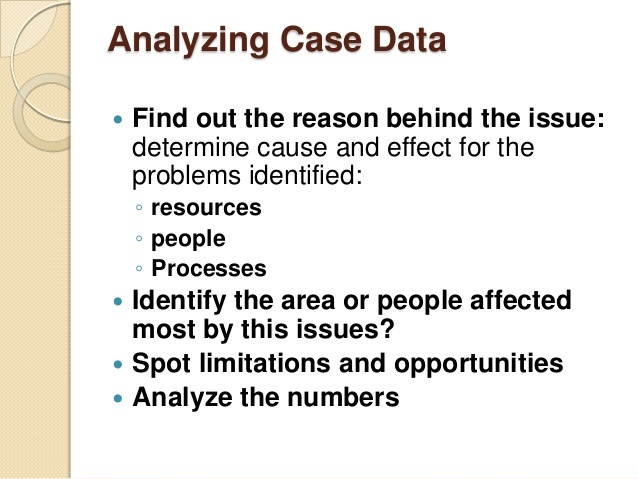 Use the facts provided by the case to identify the key issue or issues facing the company you are studying. Many cases present multiple issues or problems. Identify the most important and separate them from more trivial issues. State the major problem or challenge facing the company. You should be able to describe the problem or challenge in one or two sentences. You should be able to explain how this problem affects the strategy or performance of the organization. You will need to explain why the problem occurred. Does the problem or challenge facing the company comes from a changing environment, new opportunities, a declining market share, or inefficient internal or external business processes? In the case of information systems-related problems, you need to pay special attention to the role of technology as well as the behavior of the organization and its management. Information system problems in the business world typically present a combination of management, technology, and organizational issues. When identifying the key issue or problem, ask what kind of problem it is: Is it a management problem, a technology problem, an organizational problem, or a combination of these? What management, organizational, and technology factors contributed to the problem? o To determine if a problem stems from management factors, consider whether managers are exerting appropriate leadership over the organization and monitoring organizational performance. Consider also the nature of management decision-making: Do managers have sufficient information for performing this role, or do they fail to take advantage of the information that is available? o To determine if a problem stems from technology factors, examine any issues arising from the organization’s information technology infrastructure: its hardware, software, networks and telecommunications infrastructure, and the management of data in databases or traditional files. Consider also whether the appropriate management and organizational assets are in place to use this technology effectively. o To determine the role of organizational factors, examine any issues arising from the organization’s structure, culture, business processes, work groups, divisions among interest groups, relationships with other organizations, as well as the impact of changes in the organization’s external environment-changes in government regulations, economic conditions, or the actions of competitors, customers, and suppliers. You will have to decide which of these factors—or combination of factors—is most important in explaining why the problem occurred. 3. Specify alternative courses of action. List the courses of action the company can take to solve its problem or meet the challenge it faces. For information system-related problems, do these alternatives require a new information system or the modification of an existing system? Are new technologies, business processes, organizational structures, or management behavior required? What changes to organizational processes would be required by each alternative? What management policy would be required to implement each alternative? Remember, there is a difference between what an organization “should do” and what that organization actually “can do”. Some solutions are too expensive or operationally difficult to implement, and you should avoid solutions that are beyond the organization’s resources. Identify the constraints that will limit the solutions available. Is each alternative executable given these constraints? 4. Evaluate each course of action. Evaluate each alternative using the facts and issues you identified earlier, given the conditions and information available. Identify the costs and benefits of each alternative. Ask yourself “what would be the likely outcome of this course of action? State the risks as well as the rewards associated with each course of action. Is your recommendation feasible from a technical, operational, and financial standpoint? Be sure to state any assumptions on which you have based your decision. 5. Recommend the best course of action. State your choice for the best course of action and provide a detailed explanation of why you made this selection. You may also want to provide an explanation of why other alternatives were not selected. Your final recommendation should flow logically from the rest of your case analysis and should clearly specify what assumptions were used to shape your conclusion. There is often no single “right” answer, and each option is likely to have risks as well as rewards.